This was so delicious that I made it two nights in a row. Last night I made it according to the recipe and wow! It is so delicious. 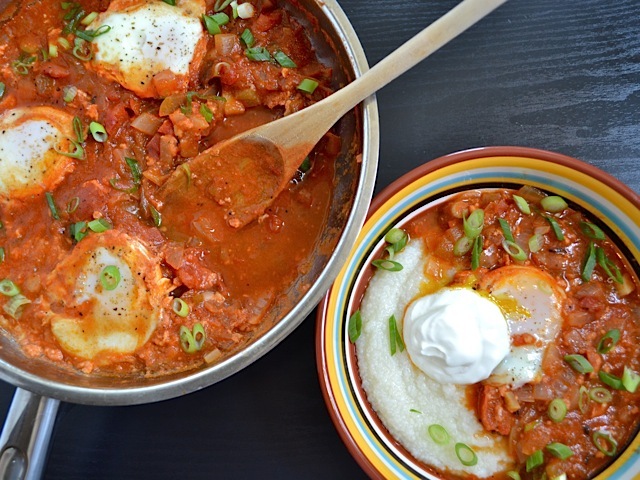 I have made something like this before, shaksuka or another name is poached egg & tomato, but it was always missing something…and then I ate this. Grits, my goodness, I would have never thought of that. I can’t believe how well of a combo the eggs, tomatoes, and grits make. The only thing I added was some cheese on top when it was in my bowl. Tonight, I don’t have a can of green chilis so I’m substituting a jalapeño. I’m also making three times the amount of grits (it’s for two people) and I used twice as many diced tomatoes…I can’t wait to eat it again, this recipe is now a staple in my rolodex of weeknight meals. Thanks again, BudgetBytes, for bringing a great meal to my kitchen. 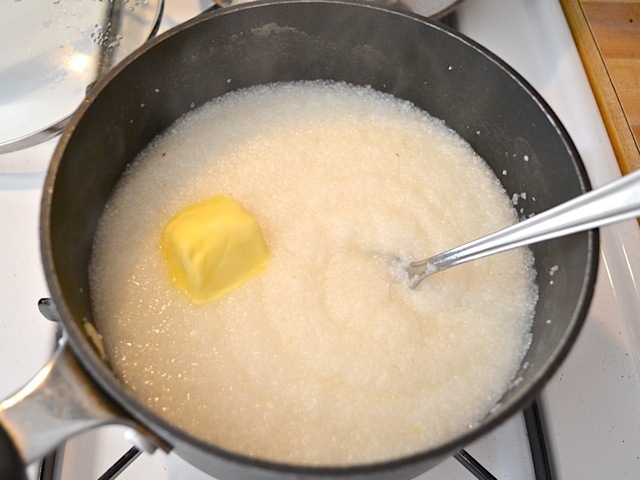 Try making the grits with milk instead of water. Or throw in a little bacon fat. I know this recipe has been floating around on here for a long time, but I just had to mention how portable this breakfast can be! I work ridiculously early so I never have time to prepare anything for breakfast in the morning. So on my day off I made this recipe then transferred the leftovers into single serving sized mason jars. I under-cooked the egg slightly so it would be ok in the microwave later. These are a life-saver!!! This recipe is so similar to a an inexpensive Italian dinner I’ve been making for several years now. 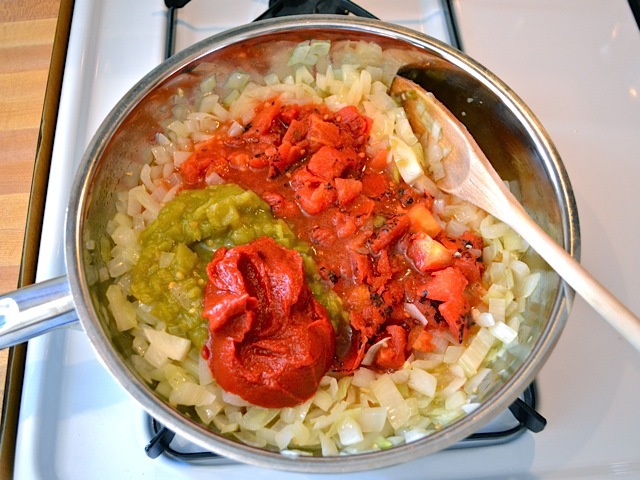 Basically, garlic, onions sauteed with couple cans of diced tomatoes, tomato sauces, tomato paste. Crack the eggs into it, cover with slices of mozzarella cheese and let poach until cheese melts then serve over hot crusty french bread. Ill definitely be tring this one. 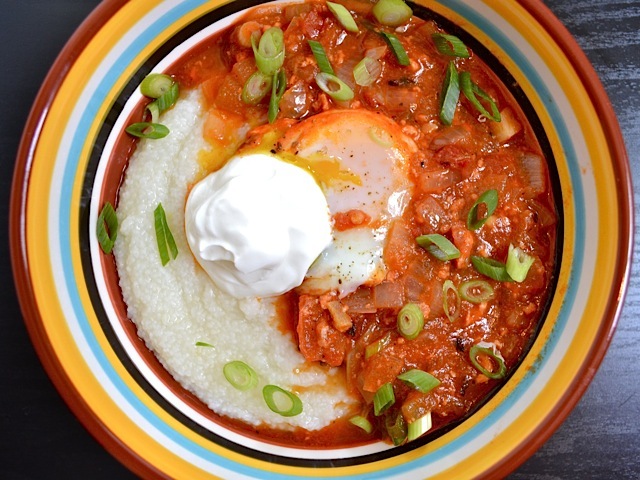 It has never occured to me that it would be good over grits, but I’m always looking for interesting breakfast ideas! 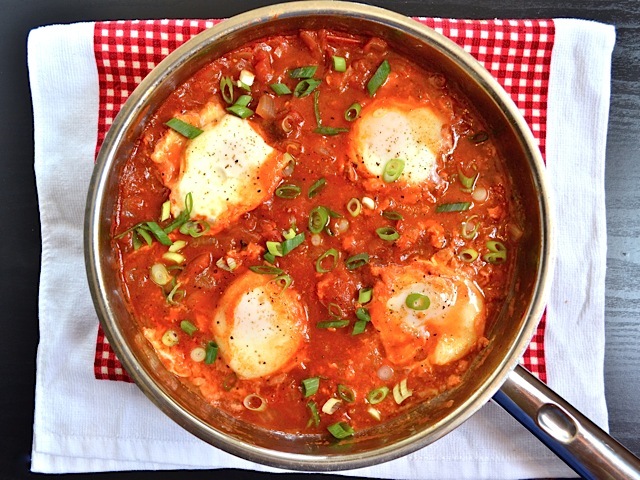 Looks like a version of my favorite breakfast: Eggs in Hell. Only I serve mine over toast. Grits sounds like a fantastic alternative. I also make a version I call Eggs in Rome, where I use more garlic, and instead of chilies I use pre-made pesto. 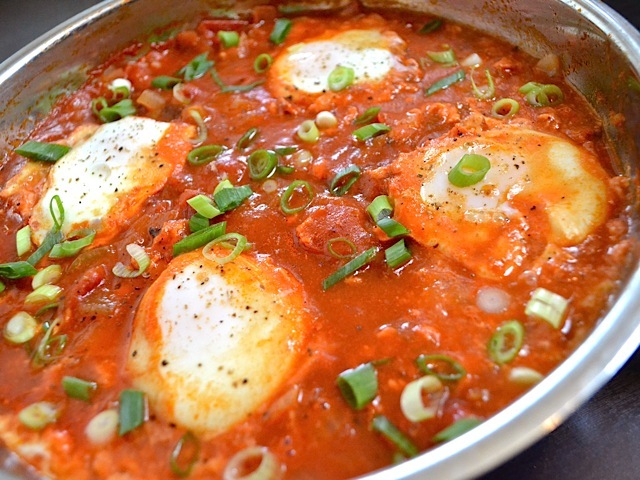 I cooked these for Sunday brunch and they were an instant favorite! My three year old even loved them. Thank you for the recipe! Delicious! And so easy to make. I’ve become very fond of grits over the last couple of years so that is what initially drew me to this recipe. I will definitely be making this one again. I was searching for an egg and grits recipe that was different from the usual and came across this one. I am glad that I found it because it was excellent! 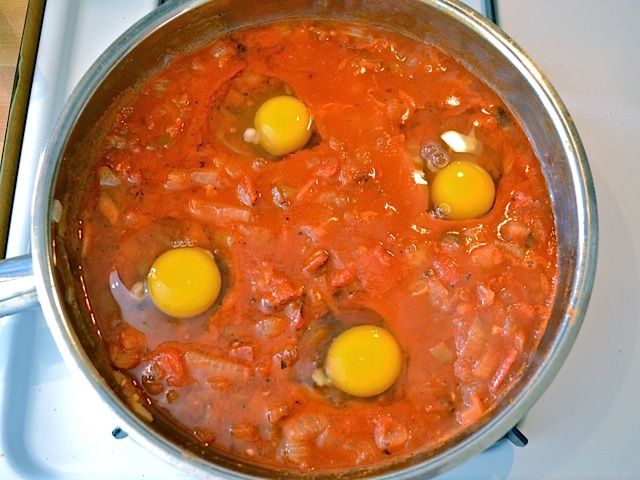 I doubled the sauce recipe and used 9 eggs to feed 3 adults and 2 kids. It was just the right amount. The only change that I made was to add more garlic in the sauce and salt/pepper the top of each egg. Very flavorful. Give it a try! This was SO good. 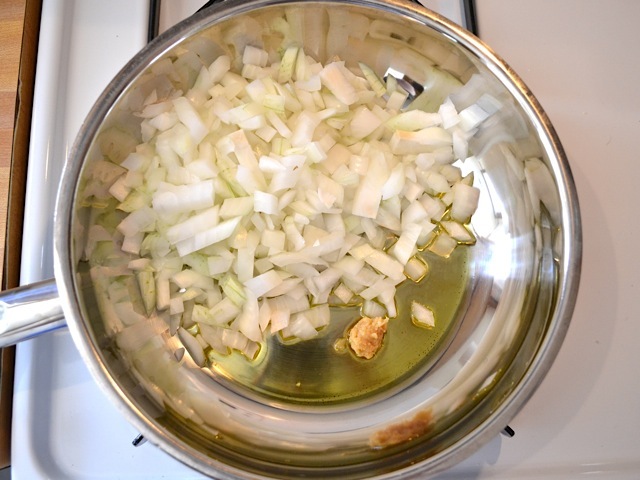 I chose this recipe because our green onions were ready to harvest from our garden. I followed the recipe exactly, and was thoroughly pleased. It’s only my boyfriend and I, and we love breakfast for dinner so this was a delicious spin on the usual egg meals we make. (And I poached the eggs too long, so it worked out that we could have it for breakfast as well) The only thing I added was some beef polska kielbasa to serve on the side with some of the sauce over it for my meat-loving other half. I will absolutely be making this again… and again. I loved the sauce. We didn’t have grits on hand so we ate it with corn tortilla quesadillas which was pretty good. We stuffed the eggs in the quesadillas. I had never made poached eggs before so it was kind of fun to make them. However, I think next time I will fry the eggs separately and pour the sauce over. I want to try the grits next time too. Excellent flavor. 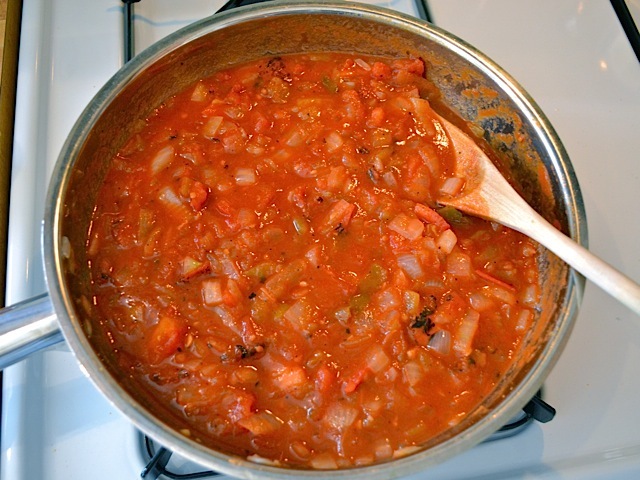 I used Italian stewed tomatoes, cuz that’s what I had on hand. Made some grits for me (my husband doesn’t like them). I can go either way on those. Cooked my eggs too much (prefer them running), but, like I said, excellent flavor. Thank you!! Made these with tomatoes and green chiles that I roasted from our garden, with eggs from our chickens. YUM! My toddler loved it, eating the tomatoes with his hands. 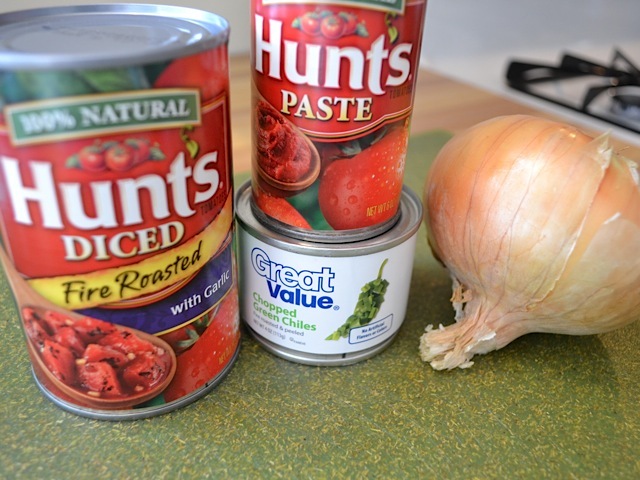 Thanks for sharing such a simple and cheap recipe (I am sure the canned version is delicious and probably a little cheaper when all is said and done HAHA)! I tried this recipe this past sunday (it was DELICIOUS) and it was a HUGE hit with my boyfriend. I think I overcooked the eggs a bit (they were definitely well done based on the 10 minutes) but it was delicious all the same. First time ever poaching eggs and my first budget bytes recipe. For a poor medical student, these recipes are gold! ^THAT is a great compliment and I’m glad you posted it because I somehow overlooked this and recipe and I will make it tomorrow. 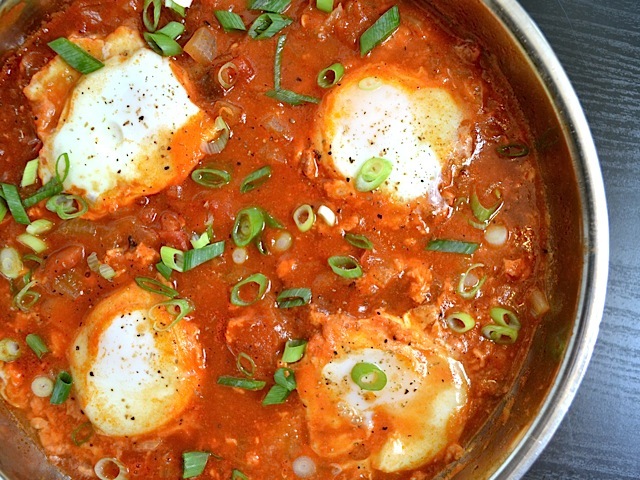 I always poach eggs when I make a “gravy” dish like sauce piquant or etouffee, so this will be a nice one to try. Congrats on winning over the kids, same here! How is that for a compliment. Your cooking is everything we do, budget, clean eating, budget some more and experiment. I don’t have picky eaters and we are trying a recipe everyday. So far all have been winners!